Thanks for the english translations of the webpage to Grace! You can download all our songs for free, with a choice of .mp3 or .ogg format. (ogg is an open source and patent free audio codec.) Just click on the highlighted link after each song. We aren't members of GEMA or any other performance rights organization. We don't want our desires to become a product on the capitalist market. Our music is protected with creative commons licenses because we believe in sharing and creating a common wealth. CD in slipcase, colored 20-page songbook with all lyrics and comments. 7 inch Vinyl with 2 Songs. Unfortunately sold out. 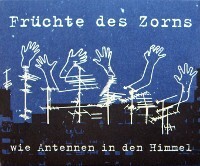 But both tracks are included on the Album "wie Antennen in den Himmel" - Like Antennae To Heaven. CD in slipcase, 16-page songbook with all lyrics and comments. 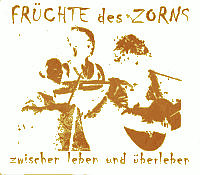 Back in 1999 when we recorded this first album, Früchte des Zorns was the two-person project of Anke and Mogli. 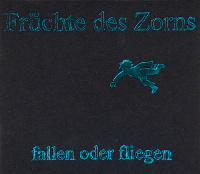 The album is sold out, but we re-released most of the songs in way better quality on the album "Zwischen Leben und Überleben" (Between Life and Survival). That's why we don't offer you a download of this early bird. If you wanna play our songs, you can download the lyrics, chords and violin/viola notes for all Albums (as pdf). 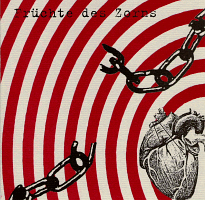 Thanks a lot for putting all the efforts in the translation of our lyrics to: A.ndy, Alexias, Bine, Café, Christin, Dave, Grace, Johannes, M2F, Markus, Matthias, Miriam, Nils, Paul und Tilman! We recorded a track with the hip-hop collective Conexion Musical. 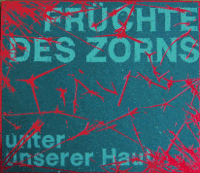 The name of the song is Dafür (mp3). 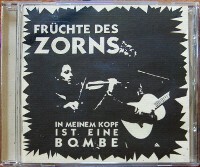 It was released on their album "Aus dem toten Winkel".